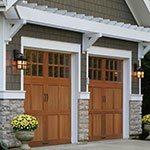 Since 1989, people have known that if they need help with their garage doors in Pearland TX, that they should call Henderson Garage Door. Starting out with just one truck and a dream, our family-owned and operated company now has over 6 trucks and an entire warehouse with a fully operational showroom. If you're looking for local experts, then you've come to the right place. We specialize in the sale, installation, service and repair of both residential and commercial door systems. Our reputation matters to us a lot at Henderson, as we're proud to be known for our prompt, professional, and reliable service. To find out how we can be of service, give our friendly staff a call! You can request service or receive an estimate over to phone or online.